Can physics be an appropriate framework for the understanding of ecological science? Most ecologists would probably agree that there is little relation between the complexity of natural ecosystems and the simplicity of any example derived from Newtonian physics. Though ecologists have long been interested in concepts originally developed by statistical physicists and later applied to explain everything from why stock markets crash to why rivers develop particular branching patterns, applying such concepts to ecosystems has remained a challenge. 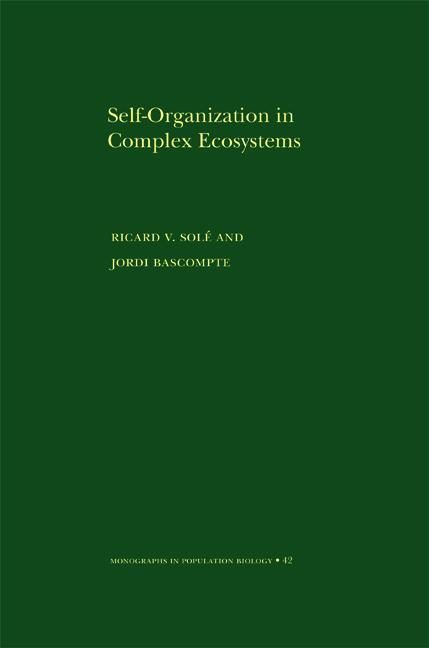 Self-Organization in Complex Ecosystems is the first book to clearly synthesize what we have learned about the usefulness of tools from statistical physics in ecology. Ricard Sol&#233; and Jordi Bascompte provide a comprehensive introduction to complex systems theory, and ask: do universal laws shape the structure of ecosystems, at least at some scales? They offer the most compelling array of theoretical evidence to date of the potential of nonlinear ecological interactions to generate nonrandom, self-organized patterns at all levels. Tackling classic ecological questions--from population dynamics to biodiversity to macroevolution--the book's novel presentation of theories and data shows the power of statistical physics and complexity in ecology. Self-Organization in Complex Ecosystems will be a staple resource for years to come for ecologists interested in complex systems theory as well as mathematicians and physicists interested in ecology. Otros ebooks de Ricard V. Solé.